So you're looking at your bill...but what are you seeing? 1. Water and Wastewater Charges reflect the amount of water you consume. 2. Fixed charges for water and sewer reflect the cost of delivering services to you, which includes our municipal franchise fee. The fixed charges allow us to build and maintain our infrastructure, provide solid waste services and ensure we are able to provide you with the best customer service experience. 3. Solid waste charges for garbage and recycling are uniform for all of our Grande Prairie customers. Note: We provide billing services for the County of Grande Prairie, Town of Sexsmith and Town of Wembley residents, but do not collect this revenue as our own. If you compare this to another essential household expense, like groceries, you'll notice your grocery bill displays the cost of each item you purchased, GST, and any deposit fees that apply. That's it. What you don't see detailed on your grocery bill is what goes into calculating each item's shelf price: the cost of production, packaging, labels, distribution, wages and more. Water and wastewater charges are like your groceries, you pay for what you need. The fixed charges allow us to build and maintain our infrastructure, provide solid waste services and ensure we are able to provide you with the best customer service experience. Periodic rate increases are also required ensure we can continue to meet our Core Purpose of Helping Grow Healthy Communities through these essential services and match increases in our everyday costs - such as utilities, maintenance and resources. Billing Date - Is the day the bill is printed. Meter Reading Previous - The read from the previous month. Meter Reading Present - The current read. Now Due - The past balance due immediately. If zero, no previous balance owing. Penalty - 3% penalty fee is charged on overdue account. Application Fee - Administrative charge to set up account. Deposit - A security deposit is requested at the time of account opening or if services are disconnected for non-payment. This is to help limit financial risk. Water Consumption - Reflects the amount of water you consume. Water Fixed Rate - Reflects the cost of delivering services to you. It allows us to build and maintain our infrastructure. Municipal Water Franchise Fee - reflects fees that are collected and go directly to our Shareholders. Sewer - Based on the amount of water you consume. Sewer Fixed Rate - Reflects the cost of delivering services to you. Garbage Collection - Reflects charges that allow us to collect garbage curbside and bring it to our Landfill. Solid Waste Franchise Fee - Reflects charges that allow us to build and maintain our infrastructure in Grande Prairie only. Recycle Program - Reflects recharges to help fund waste reduction initiatives, like operating our Eco Centre, blue bag recycling program, seasonal pick-up of yard waste, pumpkins and Christmas trees. Cardboard Recycle - The Commercial Cardboard Recycling fee in the City of Grande Prairie. IC & I Recyling Fee - Reflects charges based on recycle fees for Grande Prairie commercial customers and helps fund waste reduction initiatives, like operating our Eco Centre. 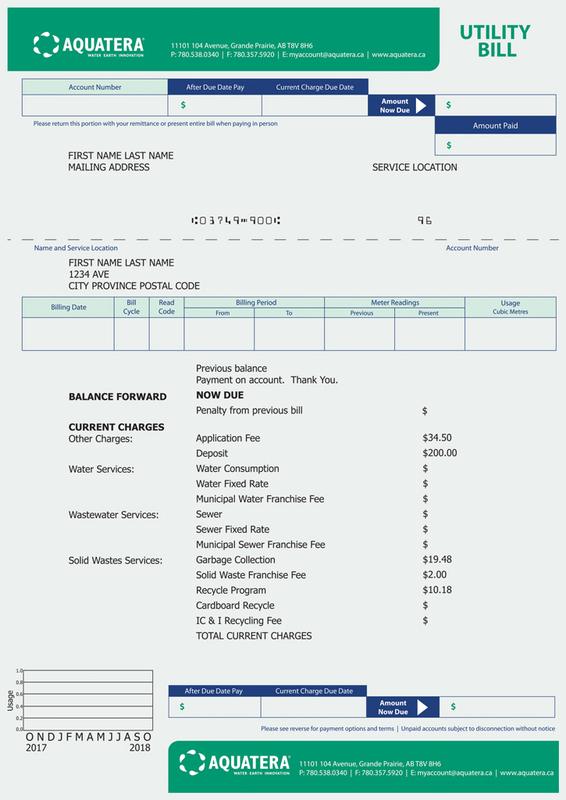 Usage - This chart shows your water consumption levels by billing month.